The Accu-Chek Combo insulin pump system couples a handset with an insulin pump to bring you a level of freedom that fits your lifestyle better. It's completely discreet, customisable to your needs and simple to use - and it fits in the palm of your hand. Easy to handle test strips. A larger, wider test strip is easy for everyone to use. It features a protective coating so can be handled from anywhere on the strip without risk of influencing the blood glucose test result. Easier blood application. Accu-Chek Aviva test strips quickly attract and absorb a tiny blood drop. The wide-mouth dosing area is designed so you can fill the strip on the very first try. Small blood sample. 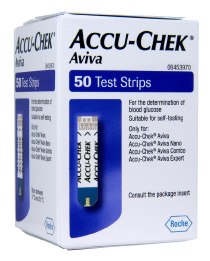 Accu-Chek Aviva test strips only require a very small sample to perform a blood glucose test – just 0.6µl of blood. The Accu-Chek Aviva test strips may be available on prescription, please contact your healthcare professional. Alternatively, they can be purchased at selected Boots stores or online. To learn more about the basics of insulin pump therapy and how to use the Accu-Chek Combo System visit our online training tool. For further information on how to use your Accu-Chek Combo System, please see your Accu-Chek Aviva Combo Blood Glucose Meter and your Accu-Chek Spirit Combo Insulin Pump Owner's Booklet. Please login to download any of the reference material below. Insulin was not delivered. This may be due to a blocked infusion set, a damaged cartridge or a dirty or damaged piston rod. Change the infusion set. If the Error occurs again, change the cartridge as well. An error in the mechanical system of the pump has been discovered during a routine automatic system check. Change the battery and the cartridge. An electronic error has been discovered in the pump during a routine automatic system check. Change the battery. If the message still occurs, contact the Accu-Chek Pump Careline for advice. Can I disconnect from my insulin pump temporarily? Because Accu-Chek insulin pumps can be disconnected at the infusion site you can remove the pump temporarily (for up to an hour) to bathe, go swimming or take part in contact sports. Always remember to check your blood glucose and correct as needed before disconnecting your insulin pump and again when you reconnect. If you are intending to be disconnected from your pump for longer than an hour, you should check your blood glucose regularly throughout the time you are disconnected, reconnecting and correcting as necessary. You should discuss your personal requirements for disconnecting from your insulin pump with your healthcare professional before going ahead. Both the Accu-Chek Combo and Accu-Chek Insight insulin pumps have an IPX8 rating. This means that both pumps are protected from brief immersion in water. As small hairline cracks in the housing of the device, or adapters and battery caps not being tightened enough could cause water to get into the device and cause damage, we recommend that you disconnect your insulin pump and leave it in a safe place before swimming, showering or bathing. This should only be done following advice from your healthcare professional, and you should test and correct as necessary at least every hour. What supplies should I take with me when I go on holiday? Some types of medical examinations, such as MRIs, CT scans and X-Rays, may interfere with the operation of your insulin pump. As such, you should disconnect the insulin pump from the body and leave it in a safe place outside of the treatment room. If you use a steel infusion set, you may also be required to remove the infusion set for some procedures. Please consult with a healthcare professional prior to the procedure. I noticed my cartridge and tubing have air bubbles in them. What could be the cause? Bubbles naturally occur in all liquids, including insulin, when they undergo a fairly rapid temperature change, i.e. warm to cool. To help to prevent bubbles, remove insulin from the fridge at least an hour before use. If you are self-filling cartridges, make sure to fill the cartridge with room-temperature insulin and draw it from the vial slowly and steadily. You should regularly check your cartridge and tubing for bubbles and prime out any that you find. Always remember to disconnect from your insulin pump before priming. How long is my pump warranty? The technical warranty of your Accu-Chek insulin pump is 4 years from the day that you start on your insulin pump. It covers technical issues with the device, but does not cover loss or damage due to misuse. Can I wear my insulin pump during sports? Your insulin pump allows you to quickly and precisely adjust your insulin levels before, during and after exercise, to carefully match your individual needs. All Accu-Chek insulin pumps are suitable to use during most types of exercise, however we recommend that you remove the insulin pump before taking part in any contact sports (e.g. rugby or martial arts) in order to prevent damage to the device or harm to yourself. What do I need to think about when going to a theme park with my pump? Many theme park rides, such as rollercoasters, are operated by high powered magnetic equipment, which have the potential to affect your insulin pump. Please check with the Theme Park Occupational Health and Safety officer about the magnetic equipment they use and what distance in meters / feet the field surrounds them. When within these fields do not wear or operate your insulin pump. Please disconnect from your insulin pump and leave it in a safe place until you are no longer within the range of these magnets. If there is nowhere safe for you to leave your insulin pump, you should take it with you, however you will need to put it in STOP mode and disconnect it from your body before entering the field of exposure. Leave your insulin pump in STOP mode until you are outside the magnetic field. When it is safe to do so, please reconnect and START your insulin pump. Please remember to check your blood glucose levels before and after entering the field of exposure. Always carry backup supplies – including hyper / hypo treatments and a backup insulin pen with you. If you are disconnected from your insulin pump for longer than 30 – 60 minutes you may need to reconnect to your insulin pump and give a correction dose (if safe to do so) or give a correction dose with your back up insulin delivery mechanism if you are still within the exposure range. You should follow your healthcare professional’s instructions to replace missed insulin or to correct a hypo. Can I go in a sauna or steam room while wearing my pump? No. Due to the high temperatures in saunas and steam rooms we recommend that you disconnect your pump and also remove your infusion set before entering. High temperatures can affect the insulin within your pump and also potentially cause damage to the pump itself. Please consult with your healthcare professional to determine what precautions you should take prior to entering a sauna or steam room.